RALEIGH – In a monumental display of support for LGBTQ people in North Carolina, state legislators today introduced three separate bills that would protect lesbian, gay, bisexual, transgender, and queer (LGBTQ) people living in every corner of the Tar Heel State. 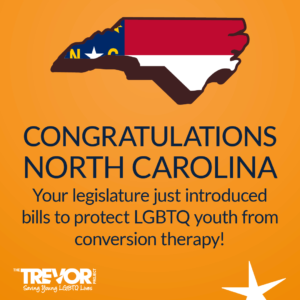 Today’s historic package includes the Mental Health Protection Act, which would protect LGBTQ minors and disabled adults from the dangerous, debunked, and discriminatory practice of ‘conversion therapy,’ which is used legally in North Carolina by state-licensed mental health professionals to try to change young people’s sexual orientation or gender identity. This life-saving legislation, introduced today for the first time in North Carolina, is supported by Born Perfect NC, a grassroots statewide campaign from Equality North Carolina and the Campaign for Southern Equality that is backed by a coalition of clergy, mental health organizations, faith groups, child welfare advocates and civil rights organizations. The package also includes a full repeal of House Bill 142, the discriminatory bill that passed in 2017 purporting to repeal HB2, which provoked international outrage in 2016 because of its brazen efforts to bar transgender people from participating in public life. HB142 merely replaced the discriminatory measures in HB2 for similar anti-LGBTQ policies, including a moratorium on municipalities from passing LGBTQ-inclusive nondiscrimination protections and a permanent ban on local governments from passing policies protecting transgender people in restrooms. Finally, the package includes the Equality for All Act, the most comprehensive nondiscrimination bill ever introduced in the state of North Carolina. The bill would protect LGBTQ people from discrimination in housing, employment, public accommodations, education, credit, and insurance. Equality NC and Campaign for Southern Equality are proud to support this crucial package of legislation as we collectively work toward building a safer, more inclusive and equitable North Carolina for all.